I have a powerful sense today that I am returning now to my own life after a considerable absence. For at least the past week, I have seemingly been living the life of someone else — someone with similar tastes and close connections to me, but someone operating on a different calendar, ruled by different forces. And, obviously, someone who doesn’t update their blog very much. On the whole, it wasn’t a bad week, though a bit on the hectic side. I’m glad to find myself back in my own shoes again today. On Saturday afternoon, I was at the Joffrey Ballet, taking in “Eclectica,” their spring program: Gerald Arpino’s 1971 piece, Reflections, plus two world premieres: Jessica Lang’s pretty awesome Crossed , a meditation on religion and spirituality in which the dancers duck around large moving stage sets, and James Kudelka’s Pretty BALLET, also quite striking. One reviewer calls it “the most intellectually engaging Joffrey program in recent memory.” Call me engaged. I then jumped into the car and drove to Sparta, Wisconsin, where I spent the night in a dive motel that shall remain nameless. Only the sheets have been changed to protect the innocent. The next morning, I drove up the Mississippi River to Stockholm, Wisconsin, to pick up some of my mother’s paintings for a new retrospective exhibition. I’d forgotten how pretty that part of the country is. I spent the rest of the day tracking down more paintings for the show across central Minnesota — Edina, St. Paul, North Branch. 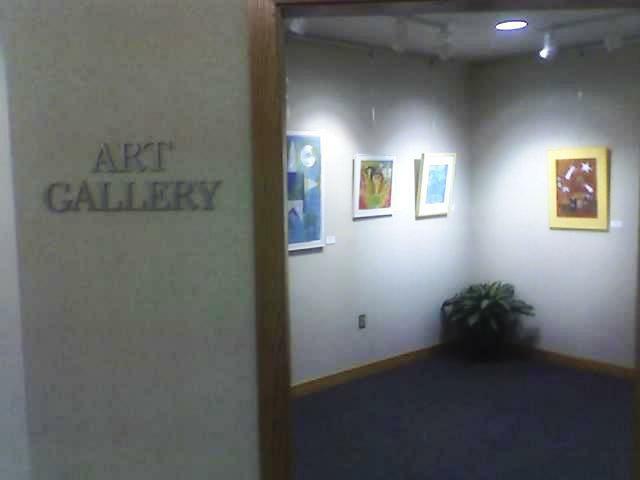 Monday morning I helped set up the exhibit in the Art Gallery at Lakeview Hospital in Stillwater, Minnesota–where my mother, my sister, and I were all born. It’s a wonderful collection of 14 of my mother’s best works, many of which haven’t been shown publicly for years. It will be open through June 29, and there are new prints and cards of my mother’s paintings for sale in the hospital gift shop. Details on hours and how to get there can be found here. Monday evening found me at Target Field, the new home of the Minnesota Twins. While ingesting far too much animal protein, I watched my favorite baseball team clobber the Detroit Tigers. Wilson Ramos, the Twins’ fine young catching prospect, got three hits in his second Major League game, this after he collected four the night before in his debut, thereby setting a new rookie record and sending Twins’ fans into a mild frenzy. It’s a fine new ballpark, too, with many thoughtful details, inside and out. I didn’t mind the raindrops that fell intermittently through the evening, not one bit. Tuesday, I drove back to Chicago, picking up along the way our oldest from his dorm to haul him home for summer vacation after his freshman year at college. Then yesterday I helped host the great historian Harry Harootunian for a couple of very stimulating talks here at the University of Chicago. The day ended at a restaurant in Chinatown, with good food and lively talk with our visitor and several colleagues. After all that, I woke up this morning and looked in the mirror, and it was me again. Welcome back, and don’t forget to turn off the lights when you leave again.